The Wolf Creek Dam: Is the State of Colorado speculating in water rights? Is the State of Colorado speculating in water rights for a Wolf Creek Dam? 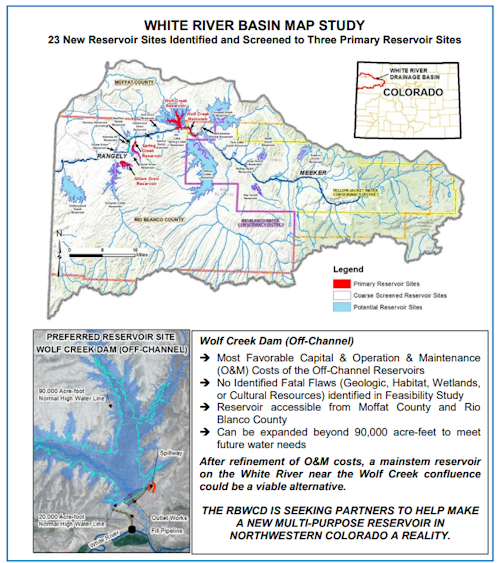 Colorado River, USA: Today, Save The Colorado is asking if the State of Colorado is speculating in water rights with its proposal for the “Wolf Creek Dam” on a tributary of the White River in Western Colorado. Recent news articles and presentations at the Rio Blanco Water Conservancy District indicate that the District, which has been supported by funding from the State of Colorado’s Water Conservation Board, is proposing a “Wolf Creek Dam” partly for the intention to “prevent the abandonment of pre-1922 Colorado River Compact water rights.” Further, in the news article from the Rio Blanco Herald Times April 14, 2018, it is stated that the proposed massive dam and reservoir would be built in part for “protecting the [White] river from Colorado River Compact curtailment”. The geographic area where the Wolf Creek Dam is proposed is currently served water by Kenney Reservoir near Rangely, Colorado, but that reservoir, even though its only 34 years old, is predicted to fill with sediment in the next 15 years making it practically useless as a water supply source. The Rio Blanco Water District, funded by the State, is proposing to essentially abandon Kenney Reservoir and let it fill with sediment and continue to block the White River, rather than investing resources in rejuvenating and dredging the reservoir. The proposed Wolf Creek Dam appears to escalate the water war occurring in the Upper Colorado River Basin states — Colorado, Wyoming, and Utah — which are all trying to build new dams and reservoirs as fast as possible even though they have yet to identify real needs for the water. Wyoming’s proposal for the massive Fontenelle Dam re-engineering, and Utah’s proposal for the massive Lake Powell Pipeline, appear to also be speculative attempts to get water that may not be needed. The Wolf Creek Dam proposal is proceeding at the exact same time that the Upper Basin States sent a letter last week to the Central Arizona Project (CAP) basically accusing CAP of taking more water out of the Colorado River than CAP needs. The Water District says it will begin the permitting process for the Wolf Creek Dam in the next year.